Elderly companions meet an aging parent’s social needs by providing supportive conversation, helping to plan social outings and providing a little friendly encouragement to do light exercise and stay mentally active. 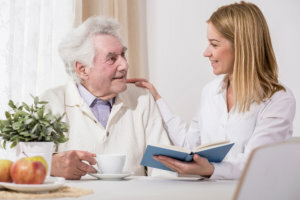 Our caregivers at Caring Hearts and Hands LLC will keep you and your loved one company inside your home, as well as outside. For your peace of mind, choose Caring Hearts and Hands LLC. Call us at 757-873-4000 for more details.